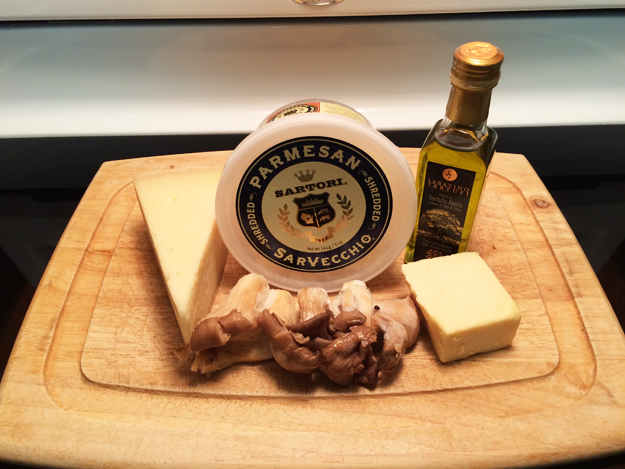 Before I got sick and the holiday shenanigans, I had decided to make another recipe that called for truffle oil. This time I made mushroom and black truffle oil mac and cheese. Truffle oil is literally worthy of it’s own recipe series. So, I have been sitting on the food photos for awhile and finally decided I needed to get this post put together. 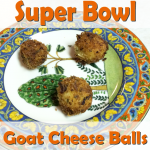 This is a cheeseaholic recipe, so you will need a wedge of Gruyere, white cheddar, and Parmesan. You will want to shred them for easier melting in the sauce once you get to that part. You will also need truffle oil, mushrooms (I used shiitake), flour, butter, milk, a pasta of your choosing, minced garlic, nutmeg, and some salt and pepper. Once you have shredded the cheese and gotten all of your ingredients out, get your pasta cooking on the stove and begin getting ready to prepare the sauce! To start the sauce, turn your burner to medium/medium high heat. Melt your butter in the bottom of the pot. Add the flour to the butter and whisk them together to combine, which will create a roux that will thicken the consistency of the sauce. Pour in half the milk after about 3 minutes and make sure the flour and butter mixture isn’t sticking to the bottom of the pot. 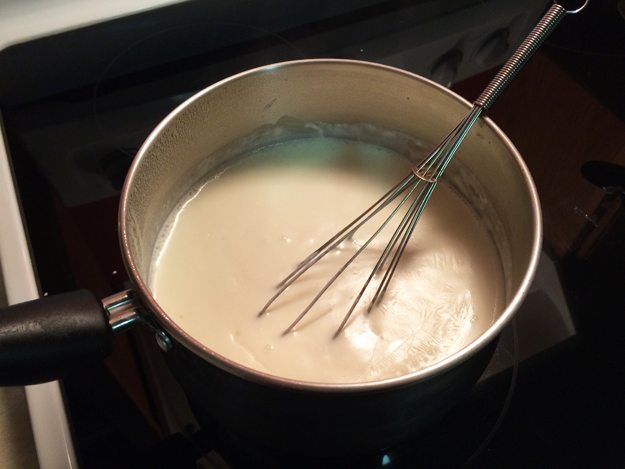 Stir in the rest of the milk, and bring it to a slow simmer. Once you have done this, add the nutmeg, garlic, salt and pepper. I love garlic, so I am usually pretty liberal with it. 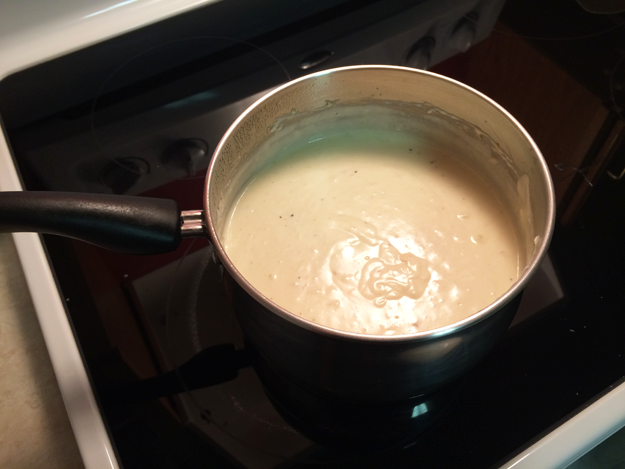 Bring the heat down to low once the mixture has simmered and thickened a bit more; then, bring on the cheese! Once the cheese has turned into hot, melty goodness, add more seasoning if it’s needed. Wait for your pasta to finish cooking, remove it from the stove and drain it. You can then add the pasta to the cheese sauce. Cut up your mushrooms and add them to the pot as well. Stir everything together until well combined. Once thoroughly mixed, distribute the contents of the pot into a baking dish that has been drizzled with the black truffle oil. Place the dish in a preheated oven at 375 degrees F. Bake for 25-30 minutes until cheese is bubbly, and the top is slightly golden brown. …And voila! 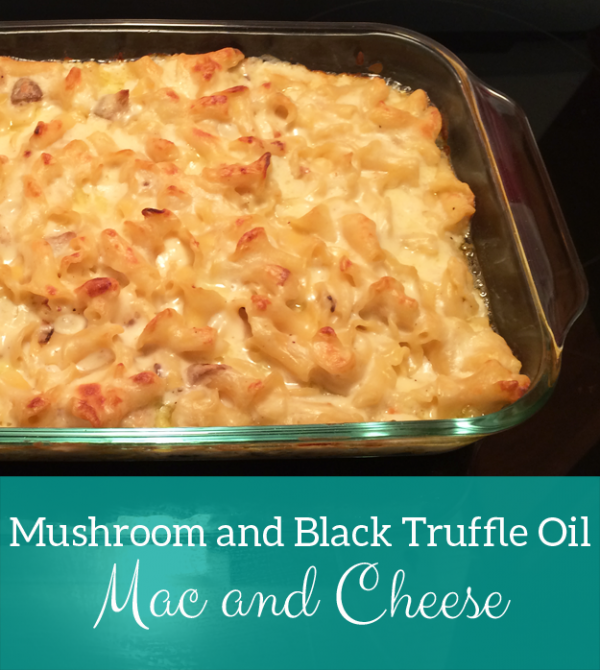 Mushroom and black truffle oil mac and cheese! But, one more thing is left before you plate and devour it! Drizzle a bit more truffle oil over the top of the mac and cheese to give it some more of that nice truffle flavor! If you want to add a bit extra texture and flavor to this recipe, you could add some herbed panko crumbs to the top. I am not a huge fan of breadcrumbs on my mac and cheese, so I didn’t incorporate them into the recipe. Also, a little side note that I will add to the recipe card is you may not want to use an entire pound of pasta. 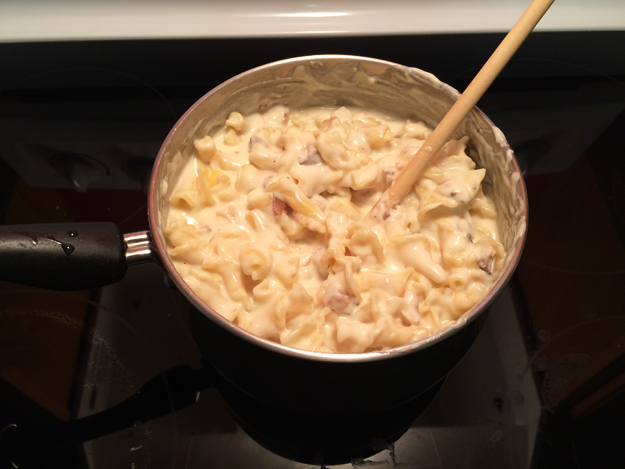 I feel like the noodles soaked up too much of the sauce and it wasn’t as gooey as I like my mac and cheese to be. Otherwise, the flavors are really good. 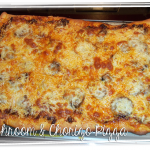 Any cheese lover will enjoy this dish! Preheat oven to 374 degrees F.
Begin cooking pasta on the stove top. In another pot, melt the butter over medium/medium high heat. Once melted, mix in flour and whisk it until thoroughly combined. Slowly add half the milk and stir. Make sure the roux, or flour mixture is not sticking to the bottom of the pot. Finish pouring in the other half of the milk and simmer for about 3 minutes. Add in the nutmeg, minced garlic, salt, and pepper to the flour and butter roux you created. Once thickened, lower the burner temperature and stir in the cheeses until melted. Take the pasta off the stove when cooked. Drain the water and pour the noodles into the same pot as the sauce. Fold them both together. Finally, add your cut mushrooms and mix them in with the pasta and cheese sauce. Drizzle 1 tbsp. 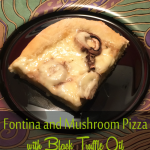 of the black truffle oil over the bottom of your baking dish. Evenly distribute the mac and cheese into the dish and place in the preheated oven. 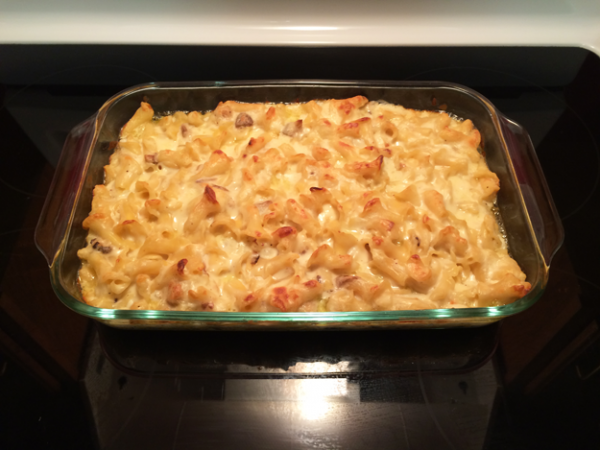 Bake for 25-30 minutes until cheese is bubbly and the top of the mac and cheese is golden brown. Once you remove the baked mac and cheese from the oven, drizzle more of the black truffle oil on top before serving. Add herbed panko crumbs before baking for more flavor and texture. You may also want to use a little less than 1 lb. of pasta, as I felt the pasta amount made the cheese sauce not as gooey.